Tag Archive | "Angela Merkel"
Angela Merkel won a large margin victory September 22, 2013, to retain her position as Germany’s Chancellor. Merkel’s political party, the Christian Democrats, received 41.5% of the votes. The opposition, the Social Democrats, garnered 25.7% of the votes, creating the largest voter margin since Germany’s reunification in 1990. Although winning by an unusually high margin, Merkel’s party fell short of securing an absolute majority meaning Merkel and the Christian Democrats must turn toward the formation of a new political coalition. Merkel’s Christian Democrats, with 41.5% of the votes, have few options to secure a majority in Germany. The Christian Democrats were last aligned with the Free Democrats, but could not push for a coalition with the group in the upcoming term because the Free Democrats failed to secure any seats in parliament. However, with the failure of the Free Democrats to secure seats in parliament, it would seem a new “grand coalition” is likely. Therefore, the Christian Democrats will likely engage in negotiations with the Social Democrat Party to form a “grand coalition” in the coming weeks. A similar coalition was formed between the Social Democrat Party and Merkel’s Christian Democrats during her first term from 2005-2009. Although the Christian Democrats are expected to reach agreement with the Social Democrat Party, Merkel’s group will also engage in discussions with the Greens Party. A coalition between the conservative Christian Democrats and the Green Party is unlikely because the Green Party has slowly developed more liberal policies than both the Christian Democrats and the Social Democrats. 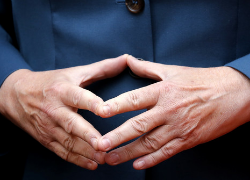 Angela Merkel making the “Merkel Rhombus,” a symbol of the German Chancellor’s calm and powerful leadership. Chancellor Merkel’s large margin re-election victory in Germany was a rarity in the Eurozone. Merkel remains one of the last leaders in office following the European financial crisis that began five years ago; the leaders of Britain, Italy, Spain, and France have all been subsequently ousted from office. German media portrays Merkel as a motherly figure for the country, and Merkel’s latest victory in Germany is indicative of the trust placed in her by the German people. The victory further reaffirms her important role in structuring the recovery process for the Eurozone as a whole. Merkel opposes the issuing of European joint-bonds, and she has been applauded by some for such opposition because Germany has come out of the euro crisis in a much better position than most of its counterparts. However, as one commentator argues, the success of the Eurozone is dependent on Germany’s actions surrounding economics, including issues such as bailouts and the European banking union. It is likely that Merkel and the Christian Democrats party will continue to practice policies of austerity, at least in part, and continue to oppose efforts to strengthen the European Central Bank through debt financing. These policies put the Christian Democrats at odds with the Social Democrats; therefore, in order to form a successful coalition, the Social Democrats will need to cooperate with the Christian Democrats in forming a policy of compromise. Both the Social Democrats and the Green Party support debt mutualisation for the European Union, but Merkel’s Christian Democrat Party is unlikely to change its opposition for such a policy. Therefore, the Eurozone crisis will certainly play a large role in the formation of Germany’s new coalition. The European Union Commission President, Jose Manuel Barroso, optimistically stated after Merkel’s victory, “We have now the first signs of recovery in Europe, but it’s still a fragile recovery.” The German population has already shown that they trust Merkel to improve the European economy and now the European Union is also relying on her to help improve the economic conditions within the Eurozone. As Merkel becomes more involved in the crisis, her motherly depiction from the German media is slowing spreading. For now, the struggling European countries, namely, Greece, Spain, Portugal, and Cyprus, will have to wait to learn their fate in the coming months as such fate is intimately linked to the direction mother Merkel takes next as Chancellor. But with unemployment reaching over 25% in both Greece and Spain, the countries are hoping for quick resolution. This is a follow up post to my prior post: David Cameron Wants Out of the EU: What are the Risks and Rewards? Sitting down to discuss their differences. According to Cameron, “Europe will be more successful if it has the strength of flexibility rather than the weakness of inflexibility. I think the best outcome for Britain is our membership of a reformed European Union.” This signals a slight change in Cameron’s phrasing of the EU/Britain relationship. Previously, Cameron seemed determined to get Britain out of the EU altogether; now, however, he has started to focus more on reforming the EU. It is likely that the backlash from both France and Germany have tempered Cameron’s hardliner approach. While Cameron and Merkel are making the weekend into a family affair by bringing along their spouses, the relationship between the two has not always been so cordial. In 2009, Cameron pulled “his Conservatives out of the centre-right bloc in the European Parliament to which Merkel’s Christian Democrats belong.” Cameron’s previous visit to Berlin in 2011 came on the heels of a Cameron speech where the central message was “less Europe” and Merkel’s speech, given on the same day, emphasized the need for “more Europe.” Granted, Britain was attempting to maintain its distance from the euro-crisis, but Merkel scoffed at the idea that Britain should still have political pull in the EU. Cameron’s visit is aimed to reduce the chatter surrounding Britain’s touchy relationship with the EU throughout the Eurozone. Recall that shortly after Cameron’s referendum announcement, France commented that Britain could not have an “a la carte” attitude towards the EU, and “German officials said Britain could not ‘cherry-pick’ the terms of membership.” While German officials are not encouraged by Cameron’s desire to roll back EU powers, they were not surprised. The consensus is that Merkel needs Cameron: whether it be for free trade policies that require approval of all 27 EU member states, or on broad sweeping free trade policies. The topics that are officially slated for discussion between Cameron and Merkel range from the forthcoming G8 summit to the situation in Syria. The highlight, however, is that the two leaders are scheduled to talk over “all aspects” of EU reformation. It is interesting to note that at the same time that Cameron seeks to increase Britain’s independence from the EU, he also is fiercely against Scottish independence. While Cameron may have hundreds of years of history to bolster his argument that Scottish independence is bad for the United Kingdom, one cannot help but be struck by the juxtaposition. Treana Hickey is a third year law student at the University of Denver and is a Staff Editor on the Denver Journal of International Law & Policy. Melissa Eddy and Stephen Castle, In Cameron and Merkel Visit, a Chance to Discuss British Role in Europe, The New York Times, April 12, 2013. Andrew Higgins, Europe is Edgy as Cameron Seeks to Loosen Ties, The New York Times, Jan. 23, 2013. Stephen Brown, Merkel, Cameron to Bring Families Together in Castle Outside Berlin, Yahoo! News, April 12, 2013, http://news.yahoo.com/merkel-cameron-bring-families-together-castle-outside-berlin-143320632.html. Carsten Volkery, Opposing Visions of Europe: Tensions Ahead of David Cameron’s Berlin Visit, Spiegel Online, Nov. 17, 2011, http://www.spiegel.de/international/europe/opposing-visions-of-europe-tensions-ahead-of-david-cameron-s-berlin-visit-a-798399.html. 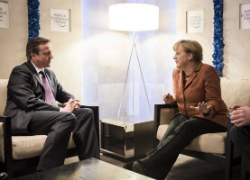 Andrew Sparrow, Cameron and Merkel to Discuss EU Reform in Germany, The Guardian, April 12, 2013. Cameron to Press for EU Reform During Berlin Visit, Europe Online Magazine, April 12, 2013, http://en.europeonline-magazine.eu/cameron-longs-for-eu-reform_275521.html. EU summit: All but two leaders sign fiscal treaty, BBC News, March 2, 2012, http://www.bbc.co.uk/news/world-europe-17230760. Toby Helm, Germany and France ‘will block David Cameron’s plan for a new EU treaty’, The Guardian, April 6, 2013. John F. Burns and Alan Cowell, Cameron Details Arguments Against Scottish Independence, The New York Times, Feb. 16, 2012.